Hang on, hang on….they haven’t finished the last one yet…. This for everyone who finds the years of, roughly, 18-30, really tough going. I’ve had dream flashbacks with this song – does anyone else have dreams with soundtracks? – with bits of memories, a lot of them about heartbreak. It’s a great song, this, and this is a great live version: the defiant, “up yours” surge of the guitars and Petty’s final, defiant howl at the end. Song from the Dark Times. There was a time when rugby test matches had a sense of occasion. Now, it seems, they’re a bit like the latest software upgrade. Don’t worry about missing this one, there will be another along in two or three clicks of a Yes I Have Read The Terms and Conditions. 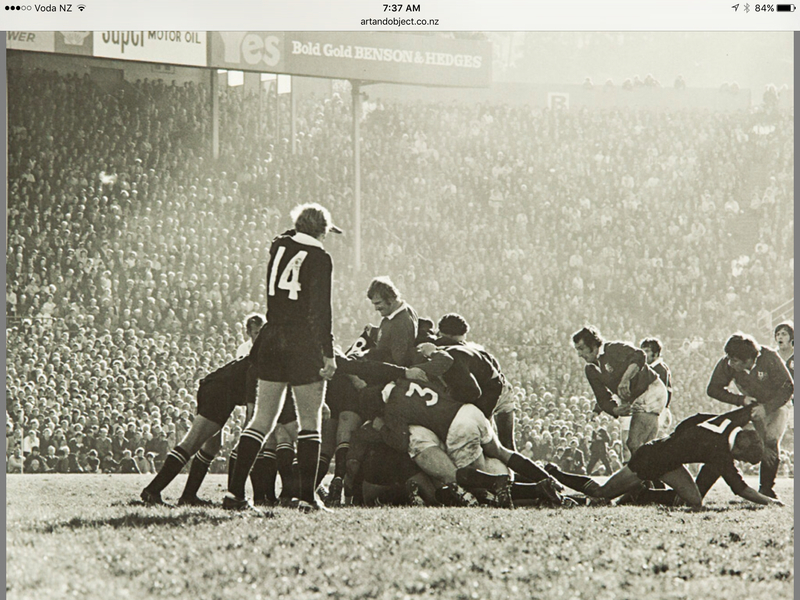 Even the Rugby World Cup…hell, it only seems the other day the first or second* most famous whitebaiter in NZ history (and son, btw, of my 7th Form History teacher) was lining up a shot at goal at Eden Park. This year? I have an uneasy feeling. And so, for now, I’m going to take a dip in the steamy bathtub of nostalgia. I like it, and besides, it has a cute rubber duck. So, here, first: an excerpt from the fillum Footrot Flats about rugby. It might as well be a documentary. Captures the attitudes and dreams of an era perfectly. And then there’s this moment, from winter 1977. The try that won the series against the Lions. It wasn’t the first test series I’d followed – that was the previous year, when the All Blacks went to South Africa – but this has happier memories. Firstly, of course, the ABs won, unlike in South Africa, when the tests were almost 16 players versus 14, partly because the All Black selectors did not take a first class fullback or an in form goal-kicker, and partly because the referees were South African and delivered some crucial, dodgy decisions at critical moments, especially in the fourth test (one referee is reputed to have half-apologised, afterwards, to an All Black by saying ‘you have to understand, I have to live in this country’ . Secondly, and of growing importance in the mid-1970s, was the Lions series did not have the moral ambiguity attached to the South African tour. The NZ Listener, in those days, had a monopoly on listing what was on TV. Yes, that’s right. The newspapers were allowed to print the TV listings for that day, but no one else was allowed to print them 10 days or so ahead, as the state owned Listener did. Whenever the All Blacks had a test series, the Listener would have a big preview edition, usually with the All Black captain of the era on the cover (can still recall a great pic of Andy Leslie, the 1974-76 captain, balancing a ball and looking purposefully into the middle distance, before the South African series). There was a centrefold pull out, with all the games on the tour: you could pin it on the wall and mark off the scores in each game. They were kind of neat. Well, I thought so. The other oddity was around whether the tests would be broadcast live on the telly. This was never officially announced or included in the tv listings. The Rugby Union, you see, was worried fewer people would go to the games. It didn’t make a blind bit of difference because everyone assumed the tests would be on the telly. And everyone was right. Rioting in the streets would have eventuated if the games hadn’t been broadcast. Would have made what happened in 1981 look like a friendly game of swingball in comparison. The first test of the Lions series coincided with National Field Days at Mystery Creek, and me and my brother were there with Dad. One of the the stalls – it may have been Livestock Improvement – had connected up a tv and the place was crowded out well before the official kick off time at 2:30pm. Remember: this is despite it being officially uncertain whether the games were to be broadcast or not. The other thing I note about this Lawrie Knight try is how people are reacting to it. The crowd, of course, goes wild, but then by this point in the game the crowd was probably fairly well lubricatd. Look at the players, though. They’re probably quite pleased, but in most cases its kind of difficult to tell. They’re certainly not going berserk and hugging each other like soccer players. That’s another thing which has changed, changed utterly. Russell Brown has a piece on this here: he points to a wider degree of comfort with emotions amongst New Zealanders, especially men, and I think he’s right there, but of course he suggests it might be something to do with drugs. Now, this is not my area of expertise, so I have to defer to Russell’s much greater knowledge of the topic. And it is quite possible – very possible in fact, – that the use of various substances is more widespread than I have noticed. But I have my doubts. No doubt a Colin Meads or similar would put it down to too much pasta and salad eating by test players, not enough mutton, and far too many women teachers. Again, I think this is unlikely. I just think we’ve loosened up a bit. Also, there is a degree of emotional incontinence around now which has probably swung too far the other way. Besides, emotional repression has been unfairly maligned, at times, I feel. There is a place for it. Sometimes you do have to Not Make a Fuss – be it about a good thing or bad thing. There is such a thing as a happy medium. Well, a reasonably content medium, anyway. We don’t want to get too carried away. * Whether you like The Bone People nor not, I rekkin Beaver has to compete with NZ’s only Booker Prize Winner for this title. One late summer morning in Ohope, after a fairly heavy night back in the mid-1980s, the hosts of the party emerged, suggesting a coffee. There was a general consensus all round that this was probably a Good Thing. The hosts then produced something I’d never seen before. Firstly, there were coffee beans. These were ground, and a kettle was boiled. The water was then poured into a glass jug before a plunger was inserted in the top. After a few minutes, and with an air of solemn ritual, the plunger was gradually depressed, care being taken to make sure the water was dark enough. The coffee was then served in glass cups. WHAT NEW TRICKERY WAS THIS? It probably can’t be exaggerated just how exotic coffee – real stuff, that is – seemed back in the Bad ‘Ol Days. 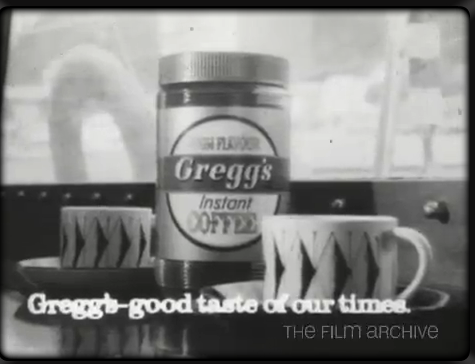 Instant coffee was the norm. Greggs for preference was usually the one in the newsrooms where I worked , for some reason. The friends who produced this strange, foreign thing had been overseas – in fact one was a native of Jersey – so I put this dubious innovation down to the offshore influence. It was, though, very nice. I treated it as a bit of a one-off which, while pleasant enough, would probably never catch on. A year or two later, in Auckland, I had my first espresso. I’d heard of these things, and had gathered they were good for waking one up. I had something of a hangover and was heading for an appointment, so stopped in at this small place in Queen St’s Canterbury Arcade. “Single or double?” was the query. Err. How big was the cup, I asked. They were, it was explained to me, the same size: a small thing which looked about the size of a film canister was shown. That seemed a bit of a rip off, but I needed that coffee. So I ordered a double, thinking this was probably going to be a waste of time. Several hours later I was still bouncing off the walls. That stuff really had an effect. I’m still a tea drinker, mostly, but tea is comfort drink. It plays a different role. Coffee has function as well at atmosphere. First, it has that fantastic aroma. Secondly, it has musical associations. Whenever I hear a Miles Davis muted trumpet solo, I crave a coffee. 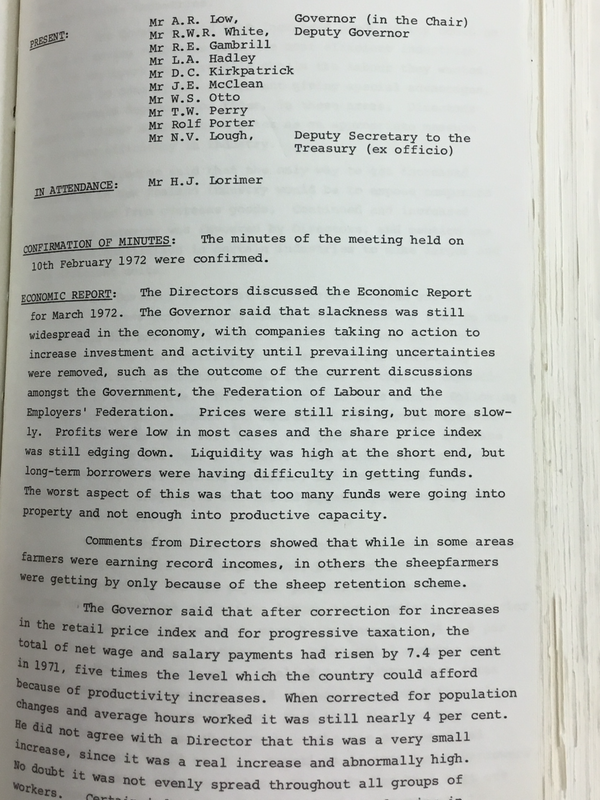 The other times of course is Reserve Bank monetary policy statement lock ups – a topical matter this week,with governor Graeme Wheeler deciding to “pull the trigger” to use the term some economists have used, on interest rate cuts. 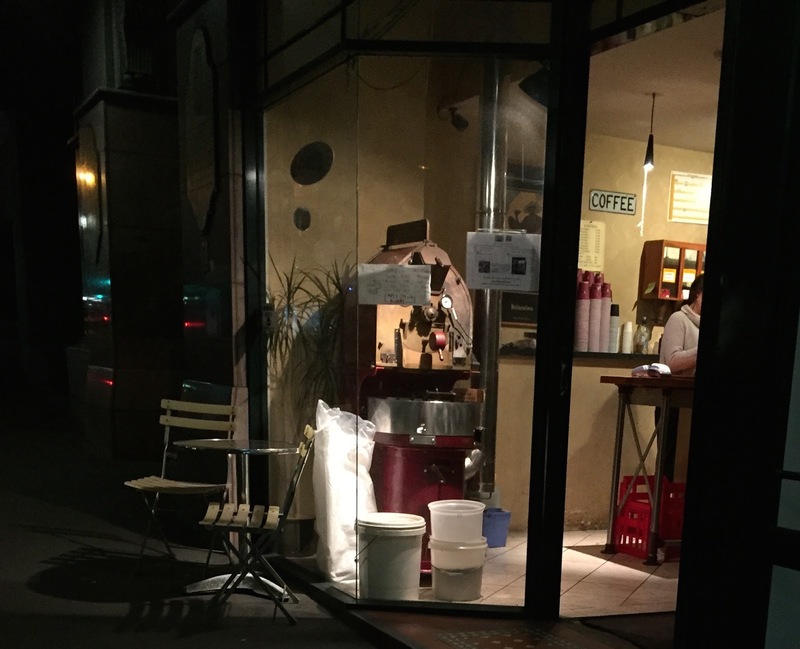 The coffee shop next to the Reserve Bank produces the best coffee in Wellington. Bar none. It is strong as well as having a well rounded flavour. Often you get strength but not such a balance: such coffees have their place but they’re a bit like heavily peppered and chilli-ed curries. This is like a vindaloo with ample flavours, or perhaps the magnificent Railway Cochin Curry in Rick Stein’s India. I still call this place the Coffee Shop With No Name because they’ve been there for several years but there is no sign on the frontage. It seems apt. They don’t need a name. They do, though, trade under the name of Old George, and sell their beans in the store or online here. From 6:30am, especially on monetary policy lock up days, folks are queueing early in that shop. Junkies, yeah. Junkies with taste, and whole lot of crunchy economic stuff to get through. If they played Miles Davis over the PA in those 7am RBNZ lock ups, it would be just about perfect. One of the great, if slightly weird, New Zild songs from the first half of the 1980s. Some would call it a golden era for NZ Music, a lot of time time it was more a rather grubby yellow colour, though that grubbiness was despite rather than because of the music. This is a lovely mix of styles – jazz, ska/reggae, and a hint of Stax-Volt soul. And that vocal! There is something very ‘strong Kiwi sheila’ about the contralto – is that the right term? – tones of the lead singer. This came out around mid-1983. Picked up the EP in the Whakatane rekkid store, use to play it on Saturday mornings while I washed my work shirts in a bucket. Spent much of the week in Auckland. It is always a bit weird going back there: I lived there for 10 years and the fingerprints of memory are still grimily splattered around the place. Mostly the inner west and south: Of the 11 years in the Sprawl I lived most of the time in a run of flats in an arc from Western Springs, through to Kingsland/Sandringham and across to Royal Oak. It bucketed down on the Saturday and I was having flashbacks to long aimless Auckland weekends, the feeling you often get in your 20s, life hasn’t really started yet and there’s all sorts things, a lot of them undefined, you need to do but for various reasons can’t yet. This was pre-property boom Auckland: arrived in 1985 just as the sharemarket frenzy was taking off and even though the first two years saw me working for business magazines all that stuff struck me as being a bit inflated. In retrospect it was a bit weird, being exposed to that mirror glass world and then going home to crappy, un-gentrified villas, passing round the cider or the Baileys (or a cheap home made substitute) and listening to Flying Nun bands and the Smiths. I have a theory – and its a long way from being original – that some people are born to be a certain age. There’s an assumption that someone’s prime is in their 20s or so – its there in that word “prime” – but that’s utter balderdash. I wasn’t all that good at being young. Nothing particularly horrendous happened: it was just a bit meh. Some of us are rather good at being middle aged. I probably got the knack of this when I was about 15, in fact. It’s been a long wait. The only big birthday I’ve celebrated as an adult was when I turned 30 because it felt like I was leaving all that crap behind and as it turned out I was right. Left Auckland a year later. It is a very different city now. In 1985, for all the surface froth, there was a sense of subsidence. A legacy of the Muldoon-era orphan-of-British-Empire vibe, perhaps. It was a lot more mono-cultural and becoming more so in the central city: in 1986 I chucked in full time journalism and became a postie (it paid more) and was delivering mail in the Ponsonby area. Again, major dissonance: gentrification was under way at the top end of places like Norfolk, Summer and Anglesea streets. There would be BMWs parked outside, I’d be delivering mail which included listed company annual reports and Labour Party membership newsletters to houses which, in the weekend, always seemed to have the soundtrack from The Big Chill blaring out of expensive stereos. At the bottom of those streets were still the last of the Pacific Island immigrant families, slowly being forced out. Sometimes I’d be taking in registered letters: they were damp and horrible houses and often the registered letters would obviously be from debt collectors or landlords. Now, of course, those houses are worth more than a million bucks. Anyway, the music from that era still resonates. The attached clip is a mournful Celtic-type number from a Flying Nun band who may have done other songs but I never heard them. According to John Dix’s monumental history of New Zealand music, ‘Stranded in Paradise’, Happen Inn – referred to in the previous post – was a less “hip”, more family friendly version of ‘Come’On, the 1960s pop show hosted by Pete Sinclair. I’m too young to remember ‘Come On’ but I remember Happen Inn: it was the more pop version of ‘Country Touch’ the other music programme run by NZBC televsion in the late 1960s. No one would call a programme ‘Country Touch’ these days. They might, I suppose, call a programme The Grunt Machine, which was the later, mid-1970s, predecessor to Radio With Pictures. Anyway, here’s a clip from, I think, Happen Inn, circa 1969. This song came out round the time I started school. A wet winter, and I found school a huge disappointment. They expected me to sit still in class, not just in my chair but on the mat. With everyone else, and all. And they wanted to read to me, rather than teach me to read. I felt quite short changed by this whole school thing. Anyway, this was around on the radio at the time. This particular song was, as noted earlier, one of those songs which was a hit overseas – in this case, Greece, by Aphrodite’s Child. Their lead singer, Demis Roussos, later went solo. He was a large bloke, with a beard and I have a vague memory of him wearing kaftans. He had a huge hit in the 1970s called ‘My Friend the Wind’, which I recall being subject to some inventive and witty lyrical alteration when I was at high school. This tune is a straight rip off of Pachelbel’s Canon in D (there’s a lovely version here by the London Symphony Orchestra), as are many other famous pop tunes. Everything from ‘Let it Be’ to ‘Don’t Look Back in Anger’ to ‘Don’t Marry Her‘ to…oh, this Canadian guy has a rant on the subject. Later, the more venerated Radio With Pictures had great local clips like this one: Chris Knox’s first post-Toy Love offering, Nothing’s Going to Happen. I seem to remember this clip being a big deal at the time: the nature of the video, in particular, was weirdly different, and the dolorous but intriguing tune was the first inkling something new and interesting was being cooked up in Christchurch and Dunedin. I don’t know if the Clean’s Anything Could Happen was intended as an Answer Song – a bit like the Jim Reeves/ Jeanne Black He’ll Have to Go/ He’ll Have to Stay numbers from the early 1960s – to the Tall Dwarf’s effort. I would kinda like to think so, though. I’ve written about this one before so I won’t ramble on it again. Not, technically, a New Zild song – it is about a place in Wales and was a big hit for English singer Marty Wilde in the late ’60s. But hell, ‘Gumboots’ isn’t a Kiwi song either. Nor is ‘Ten Guitars’. Yet New Zealanders have taken them to their hearts, like a kind of musical cholesterol. Back in the Bad Ol’ Days, on NZBC television, local singers did versions of the current hit songs, in a characteristic New Zild way. So here we have marching girls. Are marching girls still a thing? They used to be huge in this country. I have no idea why. This was probably on Happen Inn, a music show on the telly in the late 1960s hosted by Pete Sinclair. They used to do things like this. The singers are Bill and Boyd. They later grew moustaches, moved to Australia, sang ‘Put Another Log on the Fire‘ and ‘Santa Never Made it in to Darwin’. I think there’s still a warrant out.